You have told us about another pattern instruction that you find difficult or confusing, so we are adding another part to this series of posts. This time we will take a look at the phrase “complete to match first side, reversing all shaping”. This is something that you are most likely to come across when shaping the neck of a garment. 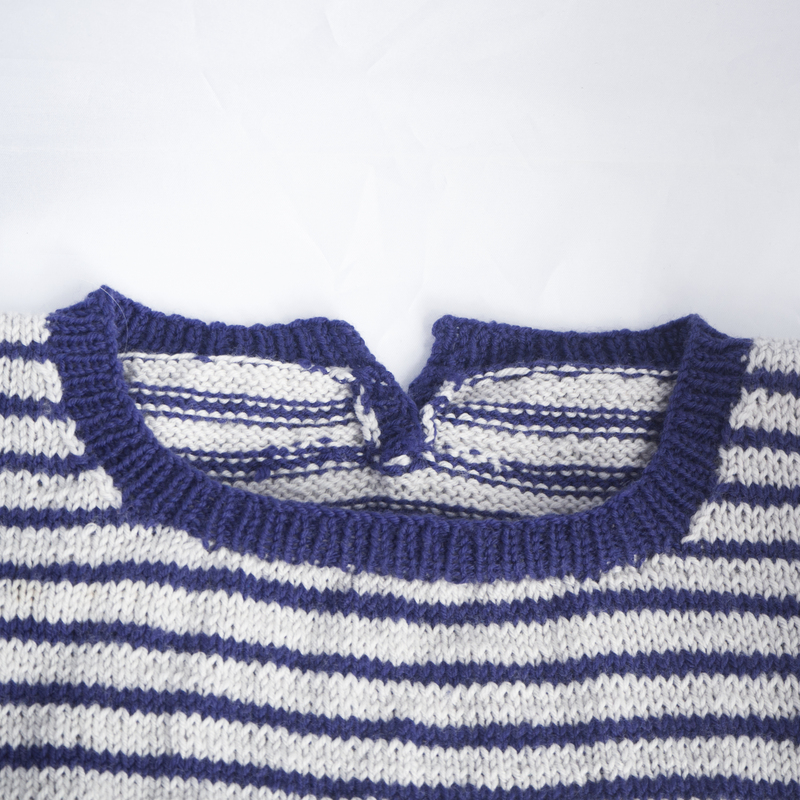 As an example we have instructions for a round neck on a sweater. Normally the pattern would have numbers for several sizes but here we’re just going to use one. Cont on right shoulder sts only. Cast off rem 8 sts. With WS facing, rejoin yarn to rem sts and p to end. Complete left side to match right reversing all shaping. What rows to do the neck cast offs on? What end of the row do the decreases happen at? Are the shoulder cast offs worked on right or wrong side rows? On the first side the neck shaping cast offs happen on the first right side row after the split for the neck. But on the left side of the neck edge is at the end of the row so you can’t cast off there. Instead you do the cast offs on the next two wrong side rows. That means when you finish the neck cast offs on a wrong side (purl) row so you don’t need to work an extra row before starting the decreases. On the first side the right side rows start at the neck edge so the decrease is the first stitch in the row. On the second side the neck is at the end of the row, so the decrease will be the last thing in the row. Plus on the first side the decrease is an ssk, which means it leans to the left. On the second side with would be neat if it leaned to the right, so we will use k2tog instead. Now you know where your decreases go, the next part of the pattern doesn’t change. On the first side the shoulder cast offs are on the wrong side row because they start from the armhole edge. On the second side the armhole edge is at the beginning of right side rows. Once you know that the last part of your shaping is straight forward to work out – if it was on the wrong side on the first side, it is on the right side on the second. The final part of the pattern would be. If you take a few minutes to think about on what side of your work each instruction needs to happen, the reverse shaping instruction is definitely one you can overcome. Click here for our post on tricky instructions and here for the one on decreasing and increasing evenly. If there are other pattern instructions that trip you up, please let us know.